If you spoil your pooches as much as we do, dog treats can get really expensive. Especially the good for your pup, minimal ingredient kind. I swear the fewer ingredients they have, the more expensive they get. 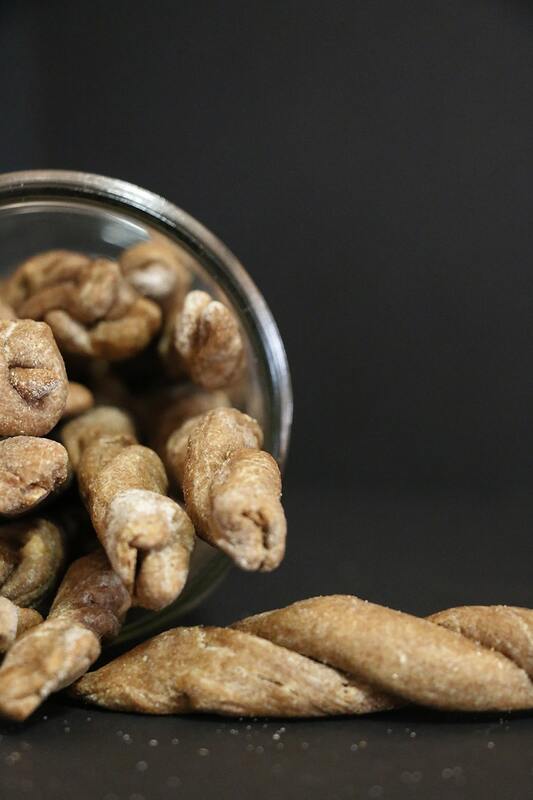 Luckily, these treats make it really easy to make tasty treats at home for your furry friends! When we look for treats, it’s pretty easy for me to decide which ones are best for them. Any of them that sound like something I could eat are pretty likely to pass the test. Simple ingredients are by far the best and this recipe is a prime example of it. We actually always have the ingredients on hand, too, which makes it even easier for us to make them treats at home. All you need is water, carob powder, peanut butter, and whole wheat flour. Super simple right? And if you’re not up for making the twists that are shown, you can easily just roll out the dough and use a cookie cutter instead. Easy peasy! Combine the dry ingredients in a mixing bowl and add the water. Mix thoroughly. Place the dough on a floured surface and roll out to a rectangle shape. Cut the dough 23 times up and down and then once down the middle across. This will yield 48 pieces of dough. 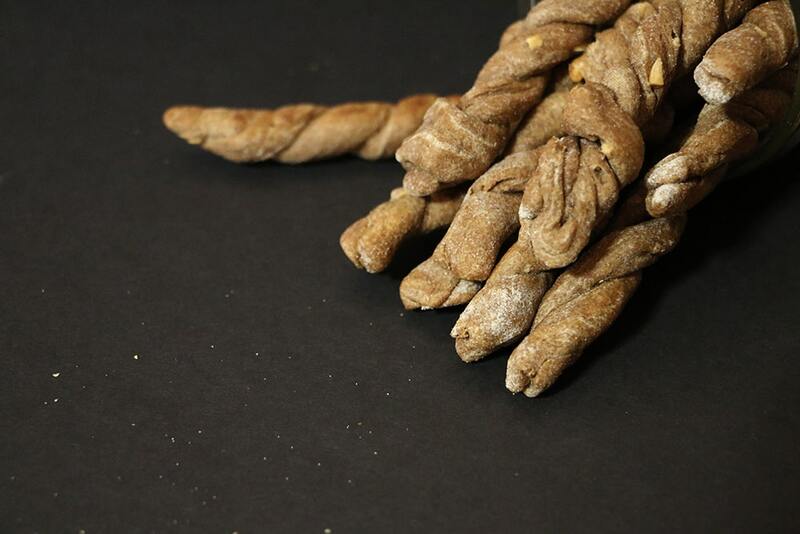 Take the dough and roll it between your palms to get a long noodle shape. Press two pieces together at one end, twist, and then press the opposite end so the two pieces are now stuck together. Repeat until all pieces are twisted together. Place all treats on an ungreased baking pan and bake for 30 minutes or until golden brown and somewhat hard. Let cool and then treat your pup! These treats will stay fresh for 2-3 weeks in an airtight container, but we barely ever have them that long! Our pups love them and that’s saying a lot considering how picky our oldest one can be. If you’re feeling even more adventurous and want to make these look extra fancy (perhaps as a Christmas gift for a dog loving friend? ), melt some carob chips and dip these treats in it! 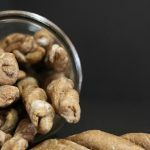 Set in the refrigerator to harden and you’ve got a gourmet, healthy treat for Fido that is pretty cheap! OK these sound insanely easy and Asher would LOVE them! When I lived at home with my parents, I used to make our dogs treats with applesauce in them. I think there was a pumpkin recipe I used to make, too. The dogs loved them! oh I bet my fur babies would love these! they do eat a few too many treats in the day and their fav is peanut butter! 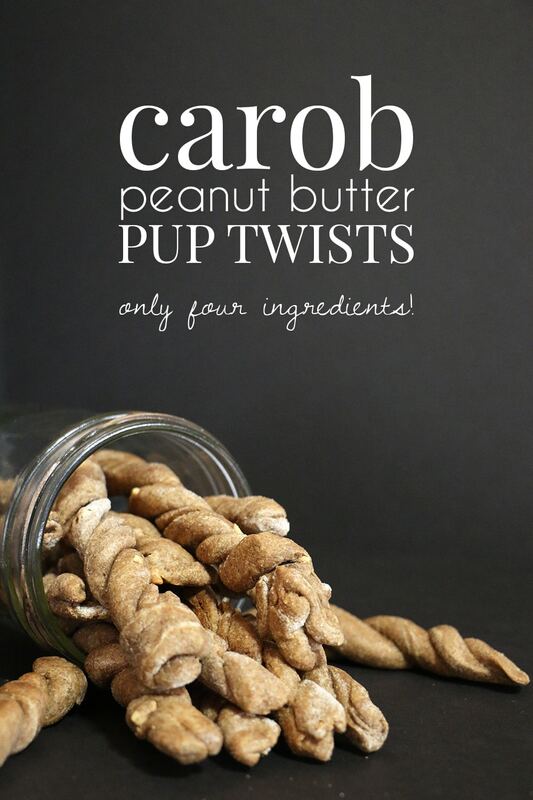 Thanks for sharing these fun twist treats (say that 10 times fast) with us at Snickerdoodle! Thanks for sharing, my dogs will love these!! Would you also mind sharing with me how you got your background all black? Wonderful pictures also. Thank you! Thank you for linking up and sharing this great post on #ShareTheWealthSunday. Hope you will come back again next week! These sound awesome! I bet my pup would love them! Thank you so much for sharing them at the #SmallVictoriesSundayLinkup!